So what makes a streamer a streamer? 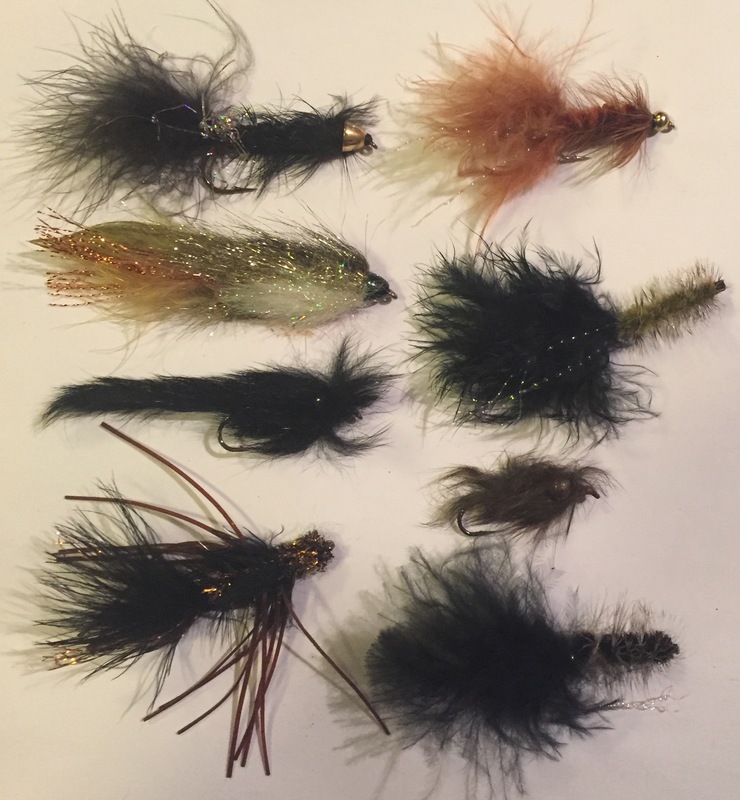 A streamer is any kind of fly that is weighted, either with a bead head, cone head, or weight tied in the body, that sinks below the surface, and which is retrieved with a twitch to represent a small bait fish or leech that is swimming in the water. The key here is that it sinks, and often has feathers or some kind of fur or sparkles which when floating through the current moves and makes the pattern look more realistic. Just like with any other fly pattern, we’re trying to mimic something that a trout might eat. The most common streamer patterns mimic leeches, minnows, sculpins and other bait fish. Woolly buggers, leeches, and minnows are all patterns one might try in pursuit of big trout while streamer fishing. The general things to take note of here are that effective streamer patterns tend to be gaudy. Flashy, furry, and outrageous. Think Rick James in the Super Freak era. If you look closely you’ll notice that most of these patterns pictured above have a bead or cone head, or have large weighted eyes. The ones that don’t are tied with weight in the body so that they sink, which gets them deeper into the water column. For the sake of simplicity, let’s consider still water fishing with a streamer for now. When rigging up, I choose the nastiest, most gaudy pattern in my fly box to start with. Cast and retrieve. And do it quick. Start out with a 5 second pause before beginning your retrieve. Vary your retrieval rate with brief pauses. Put the end of your rod in the water and point your rod tip directly at the fly while retrieving. When the fly is near you at the end of the retrieval, twitch the rod tip a bit while pulling the rod back to one side. You may see some trout following your fly, or even get a strike. Make the pattern darty and unpredictable and keep it moving, adding short pauses. Cast. Count. Retrieve. Rinse and repeat. And switch things up when you need to, both with your action, and with your pattern selection. And be ready, because the take can be vicious. In the next installment of this series, we will get into sinking tip lines, varying sink rates, and when and why you might use one or the other when fishing streamers.